Warmer, partly sunny. Temperatures around 80. We started off this morning under mostly cloudy skies and steady rainfall in southern New England. That certainly changed once the clock stuck noon, as the weak nor’easter that brought gusty winds & rain closest to the coast slid farther out to sea. Choppy surf and windy conditions will continue through this evening along the coastline, otherwise, the rest of the region will see mostly clear skies through this evening and overnight. As the wind subsides, we could see some areas of patchy fog overnight, especially in the valleys and along the coast. Into early tomorrow morning, a cold front tries to slide in from the northwest. Ahead of this cold front, a few showers will slide in along the Canadian border in the early morning hours, eventually sliding from west to east into northern Maine by late morning. As the cold front slides south and eastward through the day Thursday, a few spotty showers are possible into southern New England by the afternoon hours along and ahead of this front, otherwise partly sunny with highs near 80. 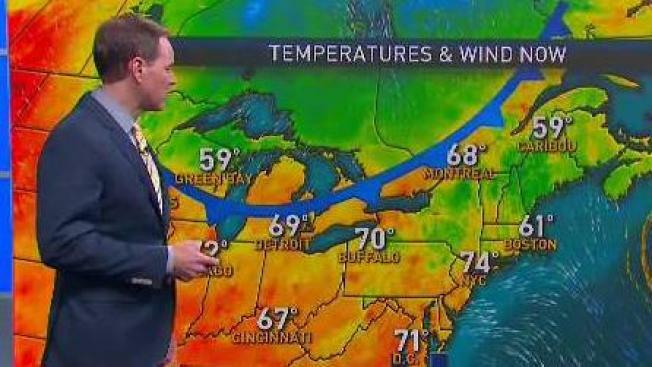 What everyone will notice is the cooler air sinking in from Canada for Friday. We see a blast of fall-like, crisp air on Friday with highs into the upper 60s under partly sunny skies. A slight warm-up for the holiday weekend with highs into the lower 70s under dry conditions for most of Saturday as high pressure dominates for at least the first half of the weekend. There’s a potential for the remnants of Harvey to reach southern New England by late Saturday into early Sunday. These would just be showers and dense cloud cover for the second half of the holiday weekend. Labor Day Monday brings drier conditions and a slight warm-up with highs approaching 80. As far as the tropics go, Tropical Storm Irma has been named just west of the Cabo Verde Islands and is expected to strengthen to a Cat 1 hurricane within the next 48 hours, but poses no immediate threat to land over the next few days. Another disturbance has popped up in the southwestern Gulf of Mexico that will have to be monitored over the next few days. As always, stay with NBC Boston and necn for the very latest details on your forecast online, on the air, or on the go on the NBC Boston/necn apps.